What could arguably be New Japan Pro Wrestling's second biggest show of the year takes place tonight as Dominion will air live from Osaka-jo Hall. 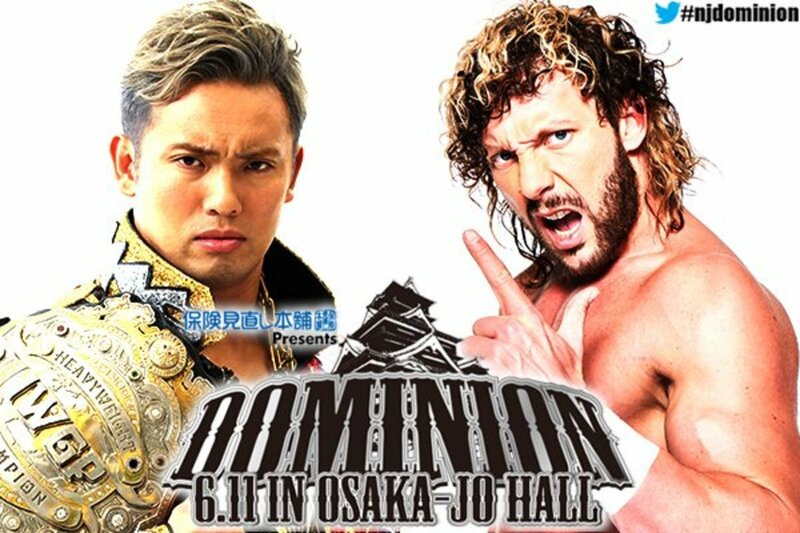 In the main event, Kazuchika Okada once again defends the IWGP Heavyweight Championship against Kenny Omega, a rematch from their match at the Tokyo Dome which was awarded a six-star rating by our own Dave Meltzer. Expectations and interest are high, with the biggest question being who will be champion not only heading into the G1, but also at New Japan’s debut in Long Beach. The co-main event has some big implications as well, with Intercontinental Champion Tetsuya Naito defending against Hiroshi Tanahashi. Naito has gone out of his way in recent months to destroy the physical state of the title, leaving it a dirty, broken mess. He has gone on to say that if he wins this match, he will have nothing to do with the title going forward. Other title matches include Best of the Super Juniors winner KUSHIDA challenging Hiromu Takahashi, Roppongi Vice defending their Junior tag titles against The Young Bucks, War Machine defending their Heavyweight tag titles against Guerrillas of Destiny, and NEVER Openweight Champion Minoru Suzuki facing Hirooki Goto in a lumberjack match. Our live coverage starts at 3 a.m. ET/midnight PT. Solid opener. Crowd looks huge for today's event. Kitamura worked a lot of the match, then tagged in Yagi who went at it with Finlay. The latter connected with a European uppercut then got the win with a stunner. Another solid tag bout, not a whole lot to talk about. Tiger Mask W didn’t do much of note, though did work with Tiger Mask IV early to take out Nakanishi. It boiled down to Togi Makabe and Manabu Nakanishi, with Makabe getting the better of things and getting the win with the king kong knee drop. First two teams in were Bullet Club (Hangman Page, Yujiro Takahashi and Bad Luck Fale) and Chaos (Toru Yano, Tomohiro Ishii & YOSHI-HASHI). There was some good action here, especially when Hangman Page and Tomohiro Ishii were working together. Yujiro holds Yano as Hangman Page hits the ropes, but Yano shoves Yujiro in front as they both collide into one another, then Yano hits a low blow and rolls up Yujiro for the win. The Suzuki-gun contingent followed, consisting of Zack Sabre Jr., Yoshinobu Kanemaru and Taichi. This didn’t last long at all -- Yano tried to go for the same exact finish, but it backfired as Sabre Jr. grabbed him, twisted him up and pinned him with a bridge. Taguchi Japan, consisting of Ricochet, Ryusuke Taguchi and Juice Robinson followed. This was fun while it lasted, some comedy but in a good way. Robinson went for the pulp friction but Taichi grabbed the ref. This was supposed to give Kanemaru the chance to spit whiskey in Robinson’s face, but it instead hit Taichi, blinding him instead. Robinson finished off Suzuki-gun with the pulp friction. The champions, Los Ingobernables (EVIL, BUSHI and SANADA) followed. Sabre Jr. wasn’t done, however, and put Robinson in the Octopus Hold until LIJ made it to the ring. Ricochet just barely avoided disaster after trying to powerbomb SANADA in the middle of a superplex attempt -- looked ugly in real time. Taguchi hit the dodon on BUSHI and went for the ankle lock. SANADA came back with the Skull End and allowed BUSHI to go to the top rope and hit the MX to retain the titles. Overall, a pretty good match with lots of action. This was a good match, different than your usual Young Bucks match. There were plenty of cool spots, but this told more of a story with the Bucks dominating a lot of the match. Hope spots were great and both teams looked really good. Matt dominated Romero early with a powerbomb on the apron, rammed his back on two ringside posts then powerbombed him on the apron again for good measure. Bucks dominated Baretta. Even when Romero managed to get back onto the apron, Nick grabbed him, ran all the way to the entrance ramp and powerbombed him right in the middle. Bucks continued to work on Baretta. They went for the more bang for your buck, but Baretta escaped and managed to fend them off. Baretta and Romero both managed to lay out Matt with the strong zero, but Nick broke it up with a swanton bomb, landing right in the back of Baretta. Nick laid out Baretta while Matt had Romero in a sharpshooter. Romero escaped, allowing RPG Vice to regain momentarily, but it was all for naught as the Bucks countered with the Indytaker, then Nick latched on the sharpshooter, giving Romero no other option but to tap. This was a really hot back and forth match, even early. War Machine looked great, they always have their working boots on and this time was no different. Guerillas of Destiny held their own, they’ve also really improved in the last few months. War Machine laid out Tama Tonga with their decapitation clothesline and were set to finish with Fallout, but Tanga Roa took out Hanson with a suplex off the top rope. Rowe was taken out but Hanson came back as they both cleared house. Hanson hit a splash from the top rope then took out Roa with a suicide dive. They lifted up Tonga but he laid out Hanson with a gun stun. Rowe countered Tama Tonga using a chair, but didn’t see Roa coming in with another chair as he was laid out. Guerillas of Destiny followed with the guerilla warfare for the win. Good match. This was designed to get Cody his first big win in New Japan against an established guy and it worked well here. I thought the finish was a bit anticlimactic, but the work in the match itself was good stuff. Cody did a lot of posing and mocking during the match, which Elgin would usually respond by attacking him and occasionally mocking him right back. A lot of good back and forth action. Cody took out Elgin with an STO and went for the crossroads but Elgin came back with a clothesline. Elgin went for the deadlift superplex but Cody cut him off and laid him out with the crossroads to pick up the win. Cody took the headset from one of the announcers after the match and said that he wanted Okada. This was the first really great, awesome match of the night. Just an intense, incredible performance from both of these two. Every spot mattered as they went in there and had a battle to end all battles, with KUSHIDA’s story of redemption finally coming into fruition. They started off early with stiff back and forth shots, brawling in and out of the ring until Takahashi gave KUSHIDA a overhead belly to belly suplex into the turnbuckle. He went for the sunset flip bomb off the floor, but KUSHIDA countered it with an armbreaker. KUSHIDA set up a chair in the crowd, but Takahashi there and ran halfway across the arena with a dropkick that sent Takahashi into the crowd. After some back and forth, he went for the hoverlock board off the top rope and managed to get it. KUSHIDA went to go for the Back to the Future but Takahashi blocked it. KUSHIDA went for a sunset flip bomb of his own, but Takahashi escaped and countered with one of his own, landing successfully. He followed that with a time bomb attempt, but KUSHIDA countered with a roll up. They meet on the top rope where KUSHIDA lands a fisherman’s suplex off the top rope. They tore into one another once again with stiff shots. KUSHIDA stomped the head of Takahashi, actually causing the fans to boo, as they were behind Takahashi in this match the whole time. KUSHIDA snaps in the hoverboard lock and drives it in hard, eventually causing Takahashi to tap. KUSHIDA went to cut a promo, but BUSHI came in from behind and misted him, setting up the next title defense. This was also pretty good. Since Suzuki-gun constantly interferes anyway, this played into the match well, and the last few minutes were really good. As one would expect, all of Suzuki-gun, as well as most of Chaos were out there as lumberjacks. And as soon as it got out of the ring, all of Suzuki-gun jumped on Goto, and even attempts by Chaos to rectify the situation failed. Suzuki focuses on Goto’s arm, wrenching it and bending it where it shouldn’t belong. Goto started making his comeback and hitting the ushigiroshi. Suzuki countered a shouten kai attempt and threw Goto right into the referee, allowing all of Suzuki-gun to come in. YOSHI-HASHI managed to clean house, sending them all out of the ring and launched himself with a tope con hilo, sending everyone to the floor. Suzuki had the sleeper in, but Goto kept countering. Goto finally hit the GTR in the front, then to the back. Goto had it won, but suddenly Taichi, who wasn’t a lumberjack in the match, came in and pulled out the referee. Goto fights back a resurgent Suzuki, but Taichi comes back with a steel chair. Suzuki follows with a dropkick, sleeper and the Gotch piledriver to retain the title. An excellent match that told a brilliant story. These two are so awesome at cultivating and creating a dramatic, intense match and they showcased it here. Despite his injury Tanahashi looked like he was one of the best wrestlers in the world today. Tanahashi starts off hot, jumping Naito as he enters as they both brawl around the ring. Naito wins that battle, poses, then begins to work on Tanahashi’s partially torn bicep. Naito dominates him, completely working over Tanahashi and the bicep. Tanahashi finally manages a comeback, hitting a big time high fly flow off the top rope and to the floor. Tanahashi focuses on Naito’s leg, tries to go for the cloverleaf but can’t get it in. Naito comes back and wrenches the bad arm of Tanahashi. He counters with a twisting slam and goes to the top rope but Naito cuts him off and beats on the bicep again. Naito lands a hurricanrana off the top rope, but Tanahashi floats over and scores a near fall. Tanahashi misses a high fly flow attempt as he battles to finish off Naito. He goes for a Dragon suplex but Naito has the arm again, at least until Naito takes out his leg. Naito hits a German suplex, then lays out Tanahashi with a reverse DDT. A Destino attempt by Naito dooms him as Tanahashi counters. Naito dodged one slingblade, but ate two as Tanahashi connected with the high fly flow but Naito kicked out. Tanahashi responds with the cloverleaf and leaves it in for a long, long time until Naito has no other option but to tap, giving the win (and whatever’s left of the title) to Tanahashi. I’m sitting here wondering if this is one of the best sixty minute matches I’ve seen. I think in terms of dramatic flair, yes, because the last ten minutes were some of the most dramatic moments in a match I’ve witnessed in a long time, maybe going back to Okada/Tanahashi from Invasion Attack 2013, one of the best matches of this decade. The big question would probably be this: did it surpass the Tokyo Dome? It’s all subjective, but I’ll say sure. While that match had a string of amazing sequences that this match did not, the drama in this match managed to even things up and then some. They managed to have a match on par with their original in a totally different way, and you have to give credit to both Okada and Omega for accomplishing such a big feat. They start it out slow, similar to last year. Omega manages to get Okada out of the ring, but Okada comes right back in, sends Kenny out and hits a big tope con hilo...but in the process, he manages to tweak his knee, giving Omega ample opportunity to take advantage. He works over Okada’s tweaked leg, including throwing Okada knee first into an announcer’s table. Okada gets a few brief moments in until he sinks in the red ink. They go to the outside, where Kenny blocks an Irish whip into the barricade attempt and hops on top of it, but Okada shoves him off, sending him face first into another set in the crowd then flies off with a big crossbody. Omega doesn’t stay down for long, as he hits a giant Asai moonsault to the floor. He tries for the One Winged Angel but Okada blocks. Omega slams him on the ground and goes for a springboard moonsault but Okada gets the knees up. Omega attempts to go for a dragon suplex off the top rope, and after about three attempts Okada takes him to the apron and hits a death valley driver. Okada hits him full force with a shotgun dropkick to the barricade. A table is set up as Omega briefly gains advantage. Okada does the rainmaker pose, but Omega immediately fights back. He meets Omega at the top rope and eats a suplex, with his bum leg taking the brunt of the damage. Omega nails the v-trigger and tries the One Winged Angel but Okada miles away. Okada fires back with rolling German suplexes. Okada hits the rainmaker, but Omega kicks out. More back and forth follows. Okada wipes out Omega with the dropkick off the top rope that sends Omega to the floor. Omega crawls to the table as Okada sets up a big splash onto the table...and executes it, sending Omega through the table. Okada remains in control as Omega has been weakened. He hits a rainmaker and retains wrist control and hits another. Omega calls for the ref as the rest of Bullet Club come out. Cody has a towel and acts like he’s going to throw it. This gives Omega enough time to recover, hit two knee strikes and hits a reverse hurricanrana. Omega eventually lands the one winged angel but Okada gets his foot on the ropes right at three. Omega gives him the gun salute, but Okada grabs him and hits the rainmaker. Omega hits the snap dragon suplex, but walks into a dropkick. Omega fires back with another v-trigger, but when going for the One Winged Angel Okada counters with the tombstone. Okada goes for the rainmaker, but Omega collapses from exhaustion as Okada misses and falls to the floor. The two battle for tombstone attempts. At the 55 minute mark Omega nails two kicks to the face, then hits a third. Omega lifts him up but Okada hits a dropkick. Okada hits the twisting tombstone but is too exhausted to make a cover. With two minutes left, both men are on the mat. Okada grabs Omega but Omega snatches the ropes. Omega hits a snap dragon suplex but Okada hits a dropkick and a rainmaker. Twenty seconds left, Okada struggles to make a cover......but cannot do it, as the bell rings, as the match goes to a draw. Omega is helped to the back by the rest of the Bullet Club as Gedo talks for Okada, cutting a promo saying how this it wasn't the best result but it was the best sixty minutes. Okada closed the show saying he'll make it rain on the entire world. Cody once again challenged Okada once they all got to the back. That looks to be the IWGP title match in Long Beach. I think this actually managed to surpass the Tokyo Dome in terms of match quality and drama -- everything on this card was good, and three of the four top matches on this show were incredible. New Japan’s show quality level is hitting a peak I don’t think anyone could have ever imagined. There will be haters, there will be doubters, but it’s really hard to find flaws in shows like these.